A delegation of the General Department of Politics under Laos’ Public Security Ministry, led by its Vice Director Colonel Souvanny Sysouphapmixay, on July 11, visited and worked with the General Department of Politics under Vietnam’s Ministry of Public Security (MPS). Major General Nguyen Hai Trung, Vice Director of the General Department of Politics and various leaders of units under the MPS of Vietnam received and had talks with the Lao delegation. 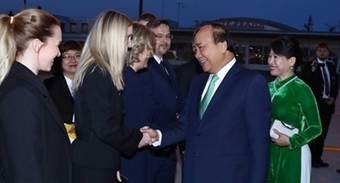 Speaking at the meeting, Major General Nguyen Hai Trung expressed his delight at receiving the Lao delegation. According to him, the bilateral cooperation between the two nations in various fields, including politics, economic, culture, society, security and defense, saw fine developments. Meanwhile, the cooperation between the two ministries and general departments continued to expand in various aspects. Members of the Youth Union organizations of the two ministries often conduct friendly exchanges and voluntary activities while the Women’s Associations of the two sides share experiences in promoting the role of women in professional issues, and the Labor Union organizations of the two ministries coordinate with each other closely in protecting the legitimate interests and supporting workers to improve their lives and professional skills. The two sides’ cooperation activities have contributed significantly to protecting national security and social order and safety as well as backing the integration and socio-economic development of each country.